The Kates flow control valve was used for the injection of de-mineralized water into turbine exhaust (NOx Water) to maintain critical NOx levels. Assured Automation suggested the Kates automatic flow rate controller as the final control element in the de-mineralized water or condense system being fed by a centrifugal pump. The Kates controller is physically located in the water skid. 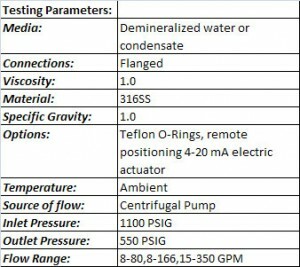 Why is flow rate critical? When the turbine exceeds a certain rpm the noxious fumes generated exceed the EPA guidelines. The injection of water reduces the noxious oxides released. The co-gen units use the low noxious oxide levels generated as a selling feature, making flow control a critical component. The Kates FC valve replaced several different control valves, none of which could compare to the control of the Kates unit. 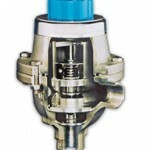 The Kates unit offered precise flow control under varying pressure and flow ranges. The Kates recommended filter kept the contaminant size in the de-mineralized water or condensate well within the necessary range. 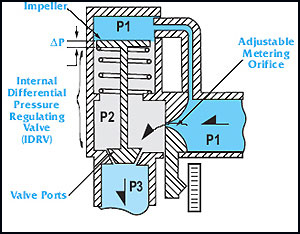 How the Kates Flow Control Valve Works. For example: If supply pressure (P1) increases, the resulting momentary pressure imbalance immediately moves the impeller downward. 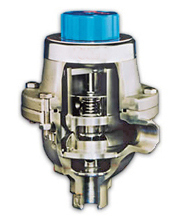 This action restricts the valve ports thus increasing orifice backpressure (P2), restoring differential pressure and the flow rate to the original settings. The unit will respond equally as well to an upset in outlet pressure (p3). 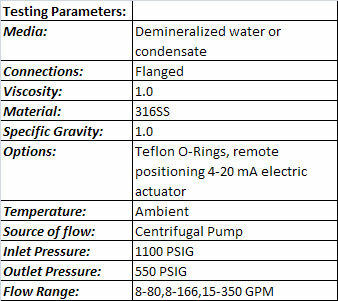 This entry was posted in Latest News and tagged flow control valve, flow rate controller. Bookmark the permalink.